There is nothing more engaging than when, as the trainer, you can get inside a dog’s head, and find out just what it is that you can do to make him “tick” even better than he already does. Each greyhound is an individual, a law unto themselves, and each one of them has his or her own buttons that you can push. It’s when you see the dog responding to your methods, things such as workouts, walks in the woods, maybe a swim-day when weather allows, massages, whirlpool treatments, meticulous grooming, lure pole games, amping up the quality of the feed, that you feel as if you have made a real difference. You treat each and every one of them as if they are an All American, from the lowliest grade Ds to the top grade As. You need them to relax, so you eliminate stress from their environment. You train them to a state of pleasant fatigue, and they sleep like babies, and they wake up as fresh as blossoms in spring—even the oldest of the warriors among them. When you turn out the lights at night, there is a pleasant, collective sigh of contentment that is palpable, as they all nest into their beds, knowing that tomorrow they’ll get to do it all again, with their friends and their packmates. There’s nothing like it in the world. And when they win, or even when they don’t win, but you know that they have given you the full measure of their ability because they realize in their own way, that you have given yours to them, you just have to feel it to know it. There are no mere words. One of the happiest moments in my time as a greyhound trainer wasn’t winning a big race, or even an everyday race. It came sometime after we had received a dog named Denver Dutch, who had raced with some distinction at a small track in South Dakota. His owner thought he was ready for the major leagues, and so he sent him to us at Revere, in Massachusetts. The dog didn’t ship too well, he arrived a bit stressed and dehydrated, a few pounds underweight—easy stuff to deal with. We got him all settled in and gave him a couple of weeks to get acclimated. He was a delightful character, a charming little dog, actually. He had a lot of what we call “class”—a refinement to him that was noticeable, conformation-wise and in his demeanor, though he was a bit rough around the edges, visually. That didn’t take too long to remedy—good food and good grooming. After a month or so, his coat began to look like black mink. It was thick and slick, and as his physical condition improved, so did his coat. He showed on the track that his owner had been correct, and that he was indeed able to hold his own and then some, against the big boppers at Revere—and there were plenty of them in those days. He was a brave and gallant racer, capable of winning against the best on any given night, at two distances. But that’s not the story line I want to go down here. “Hey man…they aren’t going to let you weigh in a wet dog!”…only Dutch wasn’t wet. 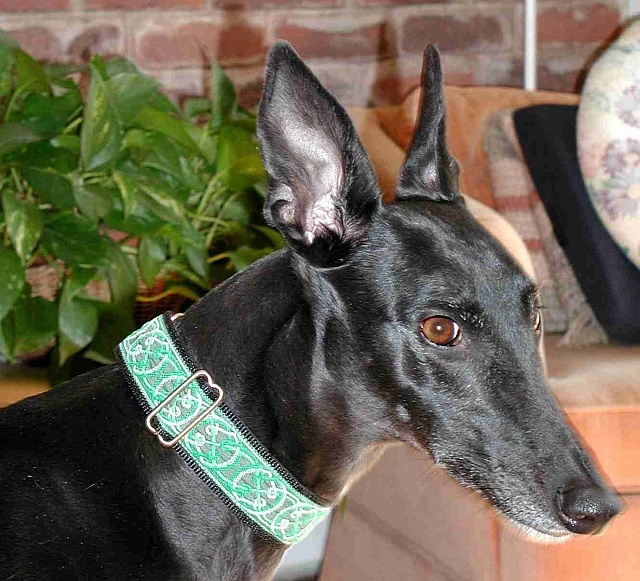 Author’s note: Years later, I saw a man walking a black greyhound on the Common in Boston. Naturally, I walked over to ask him about the dog, and the dog started going ballistic when he saw me. Lo and behold, it was the little Dutchman himself! The gentleman began telling me what a great and loving companion he was, and even though his coat had lost a bit of the luster it once had, I was more than a little pleased to see that time had been good to him, and that Denver Dutch had lost none of his class or charm.